Stone Mosaics Cut To Size - Your Size! At Artsaics, we understand that building or renovating a space, is like having an open canvas. 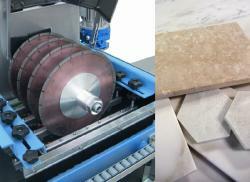 we offer the ability to have mosaics, moldings, and coordinating field tiles cut to size. This ensures that the possibilities of specific details are achievable.